Fresh Trophies from Dexter's Serial Killer Laboratory! Almost like the one at your local Grocery Store... with protruding bone and Splatters of RED fresh looking Blood! Detailed in Human Flesh Color. 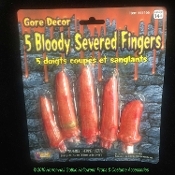 These 3-Dimensional hollow injection molded plastic Fingers would be very tasty to Hannibal Lector! Made of hollow injection molded plastic material for both indoor and outdoor Use.